Magnesium supplementation can lower blood pressure and help you relax before bed. However, if you pick the wrong one, you could end up with significant belly pain. 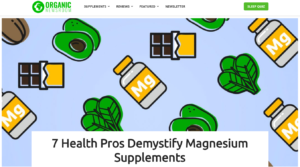 I contributed to this informative article which does a great job of demystifying magnesium supplementation. I frequently test for and recommend magnesium replacement. Give this a read to see if it could benefit you. And as always, check with your health care professional before taking any supplement.